KUALA LUMPUR: The two pieces of debris discovered in Mozambique arrived in Australia Sunday morning for examination and verification whether or not they are from missing MH370, said Transport Minister Datuk Seri Liow Tiong Lai. The examination process was scheduled to start tomorrow, he said in a statement today. The MH370 Safety Investigation Team will be assisted in the examination and analysis of the debris by experts from the Australian Transport Safety Bureau (ATSB), Department of Civil Aviation Malaysia (DCA), Malaysia Airlines and Boeing to verify their origins. Liow said: "Both pieces of debris will only be examined in Canberra once they are in the presence of these experts. "The examination process is to commence on March 21, and with the assistance of the team of experts, we hope to have results of the debris examination as soon as possible." The Malaysia Airlines' Boeing 777 with 239 people aboard disappeared during a flight from Kuala Lumpur to Beijing on March 8, 2014. Search efforts are being conducted in southern Indian Ocean. The first piece of debris was recovered from Mozambique while the second piece, also from that country, had been brought to South Africa by the family who had discovered it. A Malaysian team comprising DCA, Malaysia Airlines and the MH370 Safety Investigation Team retrieved the latter from South African authorities. "In consideration of the families of the passengers and crew of MH370, I once again urge the public and interested parties to avoid undue speculation and unfounded comments until the origins of these two pieces of debris can be confirmed by the experts," Liow said. 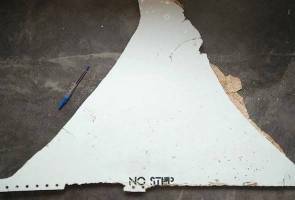 The only piece of MH370 debris recovered so far was a fragment of a wing that washed up on a beach on Reunion island in July last year. Liow said Malaysia was wholly and unwaveringly committed to the search for MH370 and would keep the families of the passengers and crew informed of any new development.